SEATTLE (AP) — For a city accustomed to losing not just games, but teams, the Seattle Seahawks' dominant Super Bowl win provided a long overdue catharsis, buoying the spirits of a fan base that hasn't always had much to cheer about. 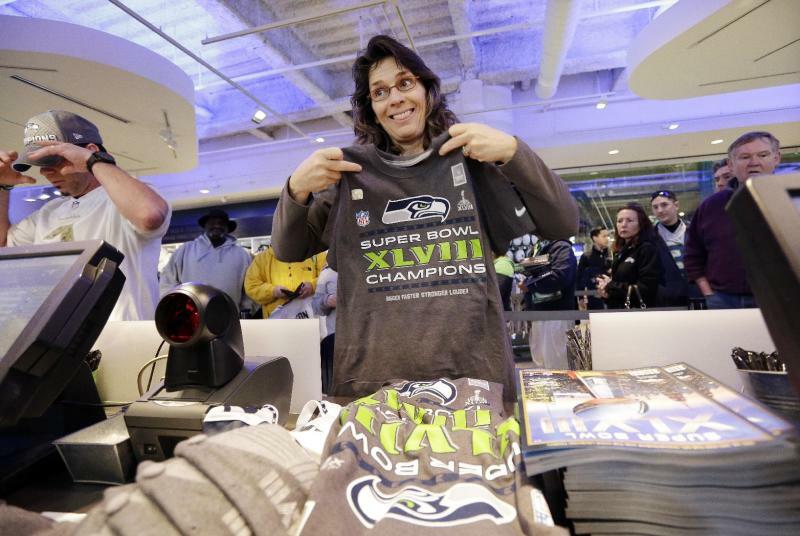 Fans poured into the Seahawks team store on Monday at CenturyLink Field to buy championship T-shirts and hats, parents made plans to pull their kids out of school for Wednesday's parade, and staff at The Seattle Times donned aprons to help hawk some of the extra 106,000 copies printed with "Champs!" emblazoned on the front page. "I spent a little bit of money this morning, but it's priceless," said Julie Keim, who bought 11 shirts at $28 apiece and 11 hats at $35 apiece for the staff at her maritime-training school in the north Seattle suburb of Edmonds. "There's so many players to be proud of on this team." The Seahawks returned Monday evening to Sea-Tac Airport, with players exiting the plane to cheers. The Seahawks' 43-8 manhandling of the Denver Broncos on Sunday gave the city its first major men's sports championship since the SuperSonics won the NBA title in 1979 — and helped erase some of the lingering bitterness over the Sonics' 2008 departure for Oklahoma City, where the team became the Thunder. In fact, before Sunday, Seattle's two major professional championships were in sports in which the city no longer competes — hockey and basketball. The Seattle Metropolitans won the 1917 Stanley Cup before folding in 1924. Unlike fans of some other championship-starved teams — say, the Chicago Cubs or the pre-2004 Boston Red Sox — Seahawks faithful haven't had the Bulls, Celtics, Blackhawks or Bruins to cheer for. Fans launched fireworks, blared horns and partied across the city as the final seconds of the Super Bowl ticked away. The celebration lasted into the night. "I can't make you understand what this means to me!" shouted lifelong Seattleite John Caro, who, with his wife Corina, both 59, whooped their way down Lake City Way in North Seattle and high-fived passersby. "We have waited so freakin' long for this!" Thousands of people packed the city's oldest neighborhood, Pioneer Square, and the Fire Department reported about a half-dozen bonfires around the city, mostly involving couches and mattresses burned in streets. The biggest blaze was near the University of Washington, where one person was arrested for investigation of reckless burning. Two shootings also were reported but the injuries weren't life-threatening. The celebration, however, was mostly harmless, even though there were about a half-dozen arrests Sunday night, and police dispersed the Pioneer Square crowd after some revelers began smashing windows and throwing bottles at officers. Videos of fans waiting politely for a light to change before crossing a street spread quickly on the Internet, demonstrating that one doesn't jaywalk in Seattle, even amid a Super Bowl celebration. Seattle's sports history has been mostly sad. Aside from the SuperSonics' relocation after 41 years, baseball's Mariners — who started playing in 1977, seven years after the Pilots moved to Milwaukee — have been woeful, losing 101 games in 2008 and 2010, and 91 last year. But there have been bright spots. The Seahawks made it to the Super Bowl in 2005, where they lost to the Pittsburgh Steelers amid complaints about the officiating that Seattle fans continue to voice. In 1994, the SuperSonics had the best record in the NBA during the regular season then became the first No. 1 seed to lose to a No. 8 seed in the opening round of the playoffs. Two years later, the Sonics couldn't overcome the 72-win Bulls in the NBA finals. The Mariners made the playoffs with a feel-good, late-season run in 1995, before losing to the New York Yankees. And in 2001, the home team tied a major league record with 116 regular-season wins but had no answer for the Yankees in the postseason. There were the championships of the WNBA's Seattle Storm in 2004 and 2010. Suggestions that the Seahawks' win was the city's first championship overall since 1979 struck a nerve among some in the city, including Storm President Karen Bryant, who wondered about the reports on Twitter even as the Storm congratulated the Seahawks on the win. But even Keim, a Storm fan who welcomed their championships, said the Seahawks win resonated more. She reserved a 56-passenger bus to take all of the staff and students at her maritime school, Compass Courses, and some friends, to the upcoming parade, which is slated to cover a route of about 2 miles through downtown before ending a CenturyLink Field. "I hope it's just crazy," she said. "Just being in a crowd where people have so much love for the team is going to be exciting."